Shades’s Lady counts as book #6.5 in the Reapers MC series. It is a novella and a fun departure from the previous books. 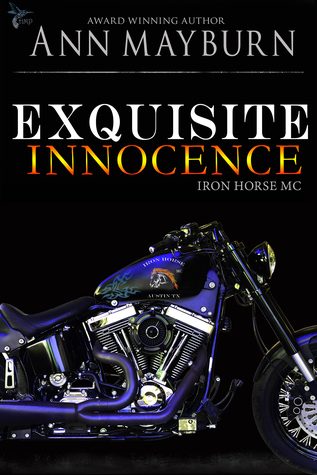 It tells the story of Shade, the national President of the Reapers MC and takes place in a different location than any of the other books. You won’t meet many familiar faces, but the new ones introduced certainly make up for it! So first off, this is a novella so obviously it is the shortest book so far. Also as obvious, I wish it was longer! I wanted to explore Shade more and the unique aspect he is in as national President of an outlaw MC. Most of the complaints that I had about the book stem from its shorter length, but I want to be fair and judge the book as the novella it was intended to be. So I did love this book and feel that it added some freshness to the series. We didn’t get to revisit any of the former main characters, although readers were briefly introduced to Shade in a couple of earlier novels.The heroine, Mandy, is also completely new to Reapers MC. The one thing that all heroines in this universe seem to share is that they have gumption! They are all real ladies, not too prissy or perfect and each has faults. But they have to have a certain level of confidence to stand up to an outlaw biker, and this is usually what attracts the hero to them. Mandy has had a rough life so far but she gave up everything to support her sister and three little nieces going through a rough time. This pretty much nominates her to knighthood in my opinion, since she doesn’t even have a bed to sleep in as a result! Shade has the patience of a Saint! It surprised me how much of a “good guy” he is considering his office, but I guess you need to have a fair amount of patience and diplomacy to be the big honcho. I wish we could have explored his character more but you can only do so much in a novella. Hopefully, these characters will show up again in future books. I love how the author weaved together the subplots and new cast of characters that Mandy brought with her. From her boss “Bone” to her family and the Sheriff’s Deputy her sister starts dating, I didn’t feel at that the story was lacking due to a smaller word count. It only became obvious in the club world. The only Club characters that really get introduced, besides Shade, are Dopey and his Old Lady. This struck me as weird, since Shade supposedly has two brothers assigned to him at all times, in a bodyguard capacity. But we are only ever introduced to one. It would have made a lot more sense to me to either add on a couple of pages every few chapters to give Muscle #2 a storyline or to just write him out completely. Otherwise, this story gets five stars and I cannot wait to get another book from Ms Wylde! She has recently teased that she is writing a book about Taz and that this will be the first book in a “side-quel”series about the Devil’s Jacks!!! Hopefully we also get Fathomless soon as well! It was originally supposed to be released in 2015 but apparently keeps getting pushed back due to publishing issues. Out of the Ashes is the third novel in the Sons of Templar series. Although this series can be read out of order (and honestly, I mistakenly did this), I’d read it in order if I could do it over again. Out of the Ashes is my favourite book in this series so far! Mia and Lexie are adorable together. It is overwhelmingly obvious that the author is a fan of Gilmore Girls, as Mia and Lexie share more than a passing resemblance to the main characters on the show. They wittily banter back and forth non-stop, and are both addicted to coffee. They have the sweetest mother-daughter relationship and similar backgrounds. Unlike in the show, Mia was born into trailer park trash, but she finds herself a mother and alone at 16 and raises her baby on her own, by starting out as a maid in a hotel working for room and board and rising to hotel manager. Lexie, just like Rory Gilmore, is a super smart, super kind, eclectic and not at all teenagerish teenager who is destined for great things. “Okay, I’m giving the coffee a hundred and twelve and the pancakes a solid nine and a half. I deducted half because I feel like they could be improved by adding chocolate chips to them,” I declared, leaning back in my seat. I rolled my eyes. “I fail to believe that any acai bowl could be “hells good.” It’s a crime to breakfast foods everywhere that that can be considered appropriate as a meal. It’s a smoothie poured into a bowl. It’s like cold soup,” I said, my nose curled in distaste. Lexie folded her arms. “Acai is a super food and it does wonders for your immune system. It’s full of antioxidants and is a much better way to start the day than with processed sugars and bleached flour,” she told me in a scolding tone. “The only way, other than coffee, to start a day is with sugar. That’s the only thing that gets me out of bed in the morning,” I argued. “That and the possibility Jensen Ackles will finally realize he’s in love with me,” I added dreamily. Lexie sighed. “I don’t know how you’ve stayed this skinny, Mom. You should need a crane to get you out of the house,” she said, scrunching her nose at me while she looked me up and down. “I don’t know how my daughter learned about acai and freaking quinoa when such things are sacrilege in my mind,” I countered. “A little thing called the internet,” she replied. Malcom, Anne. Out of the Ashes (The Sons of Templar MC Book 3) (Kindle Locations 158-171). Kindle Edition. With a teenage daughter in tow, Mia is the most reluctant of all the leading ladies so far to pursue a relationship with an outlaw biker. She is painfully aware that building a relationship with the club could place her daughter at risk and while she is more than willing to risk herself for love, no way is she going to do the same to Lexie. Leading guy Bull feels the same way. He lost his first wife due to a war with another club and has been in the throes of depression ever since. The optimism and zany banter that Lexie and Mia bring to town starts to draw him out, but Bull remains the quietest, grumpiest and most taciturn biker of the group. Even his club brothers seem to be removed from him and nervous of his control at times. I get the feeling that the only people completely safe from Bull (when he loses it) are Lexie and Mia. I’m impressed with Mia’s forgiving patience because I would have given up on him long before, but I guess that is just the animal magnetism at work. Bull and Mia also have the kinkiest relationship to date. He is definitely dominant in bed and likes to call the shots outside of it as well. Mia keeps him on his toes and is absolutely alpha when it parenting Lexie, but she loves Bull’s wild and possessive personality and is totally on board with bangin’ against the wall. I wish we had seen more of this unrestrained passion. I think my one regret in this novel is that Bull and Mia spent so much time working through his (totally justified) hangups to establish themselves as a couple, and then overcoming Mia’s reluctance to associate with people who could be a danger to Lexie, that we don’t actually see them together as much as the other couples. I would love to read another book about them in the future, even if it is a novella, and also to see more of the parent/friend relationship that develops between Bull and Lexie. There is a super sweet and heart-warming romantic sub-plot between Lexie and bad boy Killian who has been raised by the club and I can see that the author has also published a novel about them, so I am exited to read that one soon. Overall, I absolutely loved this book. As I said, it was the first one that I read, although I held on to my review so I could release them in series order. I’m thankful that taking a chance on this new-to-me author paid off and cannot wait to read more of her works!